Our senior students are enjoying the options for learning that our new Inquiry Learning Environment offers. They have range of different furniture and cushions that means they can find a spot that suits their needs. They are able to decide where they work and because furniture is easy to move, they can rearrange in a way that suits the task they are working on. Great to see you all looking SO COMFORTABLE while you are doing your learning children. Everyone looks VERY ENGAGED in their work! Yes this is a great facility to be able to use. Us the students are able to be comfertable when we work and it doesn't seen like we have to rush everything. This area is going to be filled with wonderful things by the end of the year. can't wait. 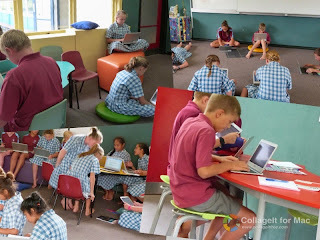 The ILE (inquiry learning environment) room is a great opportunity for senior students to work where they feel comfortable.I cant wait until the room explodes full of amazing pieces of work done by year 7 and 8 students. oh my such an easy way to write and fun too. the rooms nice and the furniture too what a good idea to use this room for this reason. 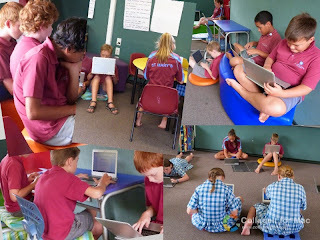 I like our new ile because it is just so cool having a room for inquiry It is a good idea to have a room like it. I really like the I.C.E room, I think it is a brilliant idea because we can relax on a cushion or couch and still work on the chrome books. This is a great place to have. Awesome to use instead of sitting at a desk all day.